2) SJBA Sunday Dhamma School is organising a Food & Fun Fair on 14/7/13 (with presale morning breakfast with scones, Malaysian breakfast, etc. on 30/6/13 and 7/7/13)to help raise funds for SJBA Temple Building Extension. Coupons can be purchased at SJBA office. Your support and dana is very much appreciated. 2) Our Mandarin Puja Service will be from 11.30am to 12.30pm today (30th June) with a Dhamma Talk on “Life of the Buddha” by Sis Yee Yean. Please invite your Mandarin speaking relatives and friends to join us. The gift of the Dhamma is the highest gift. 3)This morning’s Dhamma Talk is on “The joy that leads to the end of suffering and the suffering which leads to the end of suffering” by Ven. Achalo Bhikkhu (Brett Hansen). Ajahn Achalo was born in Brisbane Australia in 1972. He developed a sincere interest in Buddhist meditation at the age of twenty, and so at the age of 21 travelled to Thailand to study Buddhist religion and practice tradition in detail. Ajahn Achalo was ordained as a Bhikkhu in July 1997, at Wat Nong Pah Pong, the monastery established by Venerable AjahnChah in Ubon Ratchathani Province, Thailand. Luang Por Liam, the Abbot of Wat Nong Pah Pong was his Venerable Preceptor. For the past seventeen years Ajahn Achalo has lived and practiced in the branch monasteries associated within the lineage of Venerable Ajahn Chah, spending most of this time at Wat Marp Chan, in Rayong Province. He has also lived for periods of time at Abhayagiri monastery in California, USA, Amaravati Monastery in Hertfordshire, UK, and Buddhabodhivana Monastery in Victoria, Australia. His main teachers are Luang Por Liam, Luang Por Sumedho, TanAjahn Passano, Tan Ajahn Anan, Tan Ajahn Jayasaro and Tan Ajahn Kalyano. 2) Our Mandarin Puja Service will be from 11.30am to 12.30pm today (23rd June) with a Dhamma Talk on “Buddhism & Society” by Sis Tan Yee Yong. Please invite your Mandarin speaking relatives and friends to join us. The gift of the Dhamma is the highest gift. The program will be very interesting and include musical and dance performances by Asia Musical Production, Temple of Fine Arts, FGSM, etc. A bus will be provided for SJBA’s members, leaving SJBA at 6pm. (Please have your own dinner first). Please call Sis Lily or Cindy at 03-56388181, 56315299 to reserve your seat in the bus, first-come-first-serve. 3) Our Mandarin Puja Service will be from 11.30am to 12.30pm today (16th June) with a Dhamma Talk on “Happiness in Buddhism” by Sis Tan Yee Yong. Please invite your Mandarin speaking relatives and friends to join us. The gift of the Dhamma is the highest gift. 4) This morning’s Dhamma Talk will be given by Sayadaw U Rewata. Sayadaw U Rewata was born in 1955 in Thonse, Myanmar. He graduated in 1980 with Bachelor of Science at the Rangoon University. He was ordained in 1983. He followed Pariyatti and Patipatti under the guidance of Most Venerable Chanmyay Sayadaw U Janaka Bhivamsa. He has travelled widely to many countries like Japan, USA, Canada, India, etc for missionary work, teaching Metta Bhavana, Vipassana Bhavana, Suttanta Recitations, etc. He served as the Abbot in Hmawbi, Yangon in 2004 to 2006, and also has been the Abbot of the Satipatthana Vipassana Association, Springfield, USA. Sayadaw U Rewata is currently in Subang Jaya Buddhist Association to support its Dhamma missionary work. Based on the book “What Buddhists Believe” by Ven. K. Sri Dhammananda. Course Facilitators are Bro. Ananda Fong and Bro. Tan Siang Chye. on Behalf of SJBA Dhamma Subcommittee. 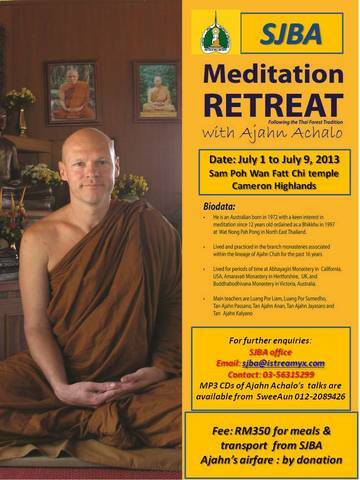 SJBA invites you to attend Ajahn Achalo Retreat in Cameron Highlands from July1 …to July9. Bus transport to & from SJBA arranged. Retreat is on with almost 30 confirmed Yogis including 1 from Australia, 1 from Singapore, 2 from Thailand, 1 from Penang. Only 15 places left of the bus from SJBA to & from Camerons. Hurry, 1st come 1st serve, call SweeAun 012-2089426 to confirm a place. Please register by calling 03-56315299 or email sang47500@yahoo.com. 2) Our Mandarin Puja Service will be from 11.30am to 12.30pm today (9th June) with a Dhamma Talk on “Buddhist Etiquette. Please invite your Mandarin speaking relatives and friends to join us. The gift of the Dhamma is the highest gift. 3) This morning’s Dhamma Talk is on “What do Buddha’s awaken to? What do they wake up from?” by Ven. Achalo Bhikkhu (Brett Hansen). Ajahn Achalo was born in Brisbane Australia in 1972. He developed a sincere interest in Buddhist meditation at the age of twenty, and so at the age of 21 travelled to Thailand to study Buddhist religion and practice tradition in detail. A bus will be provided for SJBA’s members, leaving SJBA at 6pm. (Please have your own dinner first). Please call Sis Lily or Cindy at 03-56348181, 56315299 to reserve your seat in the bus, first-come-first-serve.